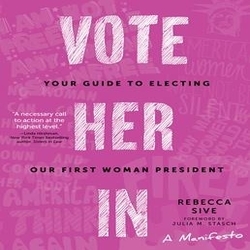 Please join Busboys and Poets Books in a book launch celebration for Vote Her In: Your Guide to Electing Our First Woman President, an inspirational, graphic-driven guide explaining why we should elect the first Madam President in 2020 and how every woman can mobilize take to get us there. Author Rebecca Sive will be in conversation with Marcia Greenberger, founder and co-president emerita of the National Women's Law Center. In the wake of the Women’s Marches, #MeToo and #ShePersisted, Vote Her In makes the case: there is no better time to elect Madam President than now. This crucial book empowers every American man, woman, and girl who cares about our nation’s democratic future to join forces and harness their collective power in the run-up to 2020 and, at last, to form a more perfect union. *The book will be available for purchase at our bookstore. Rebecca Sive has held executive positions in business, government, philanthropy, and nonprofits. Sive was a founding board member of the Chicago Foundation for Women and was part of a national group of women leaders who developed women’s issues agendas for Presidents Bill Clinton and Barack Obama. She is the author of Every Day Is Election Day: A Woman’s Guide to Winning Any Office, from the PTA to the White House and has taught at the University of Chicago Harris School of Public Policy.